The Broke and the Bookish : One Space or Two? Take a second and think about how your typing habits. More specifically when you end a sentence, after you type that period do you hit the space bar once or twice? I'm sure the majority of us would say we all hit the space bar twice. Well, in this case the majority loses. A few days ago I came across this interesting article, Space Invaders. It's about the number one rule of typography most people break: they put two spaces after a period. Who knew that the correct way was only one space? I sure didn't! All throughout school whenever teachers were talking about how to format papers we were always told "never begin a sentence with 'because' or 'and' and there are always two spaces after a period". Now I am rethinking all those English classes. 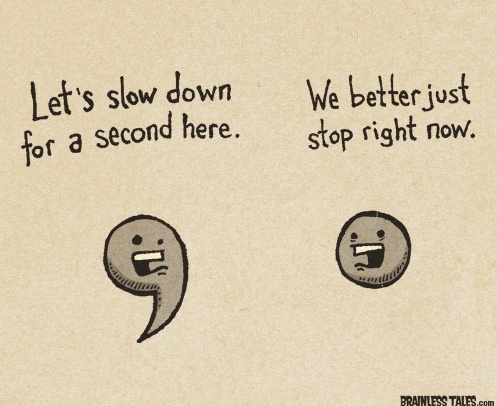 are you guilty of this heinous grammar crime? Are you a one or two spacer? I tried my absolute hardest to only have one space after each sentence in this post. But it is SO hard after having two spaces ingrained in my head for all those years, it's almost second nature to hit the space bar twice. *Edit: I am actually really surprised at the number of people that are one-spacers! Two spaces after a period was ingrained into my head in school (I graduated high school in 2004). Actually, my Typing I class was on a manual typewriter. Some of you probably don't even know what that means.....the second semester we got to use the "electrics!" I can see how on a typewriter they would want you to use two spaces. Easier on the eyes! I learned on a electric typewriter and it was pounded into our little heads that you must hit the space bar twice after a period. I've only recently realized the rules have changed and am trying to adapt but it's tough to break such an ingrained habit. My typing class was on a manual typwriter, and this was in 1993! Luckily I had an electric typewriter at home. I've never done two spaces. Ever. That might be because I'm younger though? I don't know. I don't think I could type with two spaces! It feels awkward to me. To me, two spaces just looks like too much space. It's strange, though, how grammar rules seem to adapt and change as the years go by. It is strange how grammar rules adapt over the years. Just like how they seem to be adding new "slang" words to the dictionary! Two spaces is such a habit! It's going to be so hard to break! I've never done two spaces either, and I've used that article in countless arguments against two-spacers. I've found that two spaces after a period makes me pause over-long between sentences and interrupts the flow of whatever I'm reading. My fiance even puts two spaces between sentences in texts sometimes and it drives me a little nuts! I'm guilty of being a "two-spacer". It's just how I was taught and I don't even think about it anymore! REALLY!?!?!? I'm automatically hit the space bar twice after a period. It is a habit I will have to break. It is such a hard habit to break! Now when I'm typing I have to pause and slowly hit the space bar once. Good luck! I have always been a one-spacer. For whatever reason, I was never taught the two-space rule in school. It looks very strange to me (depending on the font/page) and I'm always confused by people who stand by it. I edit sometimes as a favor to friends/family and almost always end up deleting extra spaces after periods. I also was a copy editor at my school newspaper and many of our writers did two-spaces. Especially in newspaper type, it looks strange spatially. Clearly I was taught the wrong way all throughout school! Two spaces are so automatic after a period, I don't even think about it. I've actually read before that it's only supposed to be one space now, but I was taught two spaces in my high school typing class only four years ago! They really need to start teaching that at schools because when I was younger I only typed one space. It was the class in high school that got two spaces ingrained in me. I do the same thing at my job! In school I always used two spaces, but over time I have changed over to one space. I'm not sure how the switch-over even came about, but the more I started typing things to be seen on a screen (like on a blog) rather than just to be printed out, two spaces really did start to look weird. Funny how these things happen. I used to always have two spaces at the end of the sentence because I think that is what we are first taught in school (or at least I was when I was younger). Then I became an English and Journalism major in college and I soon learned that you only use one space. It took me a while to break this habit but I did, and now I only ever use one space. I think it looks cleaner. I always thought it was two, but because of your handy post I just read that publishers and papers only want one, for the new fonts on computers. Huh. Though, MLA online just told me that two was just fine and you aren't guilty of a heinous crime (I was worried there!) But obviously that is the way of the future. Imagine all the work my right thumb will save?! I used to automatically do two, the way I was taught (I graduated high school in '01 for comparison sake), but I broke that habit a few years back. Most of the time online, even if you use two (or twenty) when you're typing, only one shows up when you hit publish (unless you manually put in extra nbsp's with HTML), so I eventually cured myself of the half-second I was wasting, typing a space that doesn't show up anyway. My eyes honestly can't tell the difference between 2 spaces and 1 space like some of the commenters are saying. *shrug* So I'll stick with my two spaces. I have a friend who puts ZERO spaces between her periods and the next word, and that drives me nuts. I have never heard of a one space rule before. I've also just done one out of habit, but it was never formally taught in any of my courses. Always a tone of discussion on how large the indent of the second paragraph should be and the underline/double underline debate was a thing, but never anything about double spaces after a period. Huh, I never knew there were people how put two spaces behind a period! I've always put one... I can totally see it being a hard habit to break though! Haha. I was forced to break the two spaces after the period in a college computer class! It is a hard habit to break. Good luck! I've always been a one space after each period type of person, and it always secretly drives me crazy when people put two! Interesting article, lady! I've typically always done one space after typing, however, I think the two space rule was used for formatting reasons when typing manuscripts via a typewriter. It was easier to read the work and edit that way. It's one of those traditional rules that's sort of gone by the wayside as grammar/language changes. Plus, I'd like to note (in regards to starting sentences with the 'buts' and 'ands'), that it's okay to break the rules as long as you know what those rules are and why you're breaking them! So write on, dear friends! I converted a few months ago. It was difficult, but one space is starting to feel natural now. Good luck! I've never thought to put two spaces, and I never knew others did, could be the ultural difference? Like how we (brits) write colour and across the pond it's color? I was taught typing in Catholic school (though not that long ago, I'm only 24) and the two space rule was drilled into us. My sister, who is ten years younger and also learned typing in Catholic school, just informed me the other day that you only need one space. I'm not one for change though, and my boss doesn't seem to mind two spaces. I never knew where this two-space thing came from. Whenever I proofread friends papers and that two-space thing popped up, I just changed it so it one space and was very confused when they got mad at me. I've always been a one-spacer. The whole two-space thing has just... it's always confused me. I've always been a single-spacer and so is everyone else I know. Do people actually put two spaces after a period? And why?! My mother does the two spaces thing, and it drives me nuts! Haha. People are mentioning their ages in the comments, and how maybe they only do one space because they are younger, or two spaces because they are older. I wonder what the ages are? I'm almost 26, and was never taught to do two spaces after a period. How old are some of one-spaces/two-spacers? I'm almost wondering if it's a geographical thing rather than a time period kind of thing. It'd be interesting to do a poll on this! In my history class, if we didn't put two spaces in after a period our grade was lowered by a letter. SOMEONE HAS BEEN LYING TO ME FOR A VERY LONG TIME. Not happy. I will say that I use one space for just about everything else though. A belated teenage rebellion, perhaps. This one space thing is new to me and I still want to two space all the time. I learned typing on an actual typewriter in jr high in the late 80s (I'm 38) so this is where I got it. I will try to stop, and see, I two spaced after my first sentence! Gah! This is interesting, I've always done one space after. I always thought I was in the minority loss but I WON!! yay, victory is mine!! I believe that I was taught two spaces, but I always thought that looked dumb and rebelled with one space (unless I was stretching to fill some page limit). I took a class on typography in college... it ruined me for most billboards and store signs. Papyrus makes me cringe. I was always taught only one space, but I've heard of many others learning two. I wonder why the crossover happened at some schools earlier than others? Seems like none of us ever actually experienced monospaced fonts! I was brought up on two. I don't know when the change happened, I think I became aware of it in college. Now I'm even more special because I've tried to convert but the darn double still comes out sometimes. Though the nice thing is I just search documents for a double space and replace with a single space so no one usually knows how special I am. I just checked and it actually varied what I did in this comment!! THANK you. It's wrong now, and dated. Sorry to say, but if you put two spaces after a sentence it's probably because you are a baby boomer or in Gen X! My English teachers never taught me the two space rule. In fact, I never found out about it until college. And then it was as an explanation for how typing used to be done. Apparently two spaces were the norm with typewriters and such. But since word processors on computers are much better formatted, the two spacing rule has become obsolete. Or so a history buff friend explained to me. Just reading this right now makes me nuts! I swear in COLLEGE I was taught TWO spaces! ERRRRR! I was taught two spaces in late elementary/middle school when we first started using computers for projects (though they were mostly just to play Oregon Trail =P), but by high school it was one space, all the time. So thankfully I didn't have to break a habit! I have a friend who does two spaces after periods and I would always delete them when I edited her papers during Uni. I use two spaces. It was also the way I was taught to type (and I'm not a baby boomer!). Oddly enough, I seem to be able to turn off the habit and use only one for things where I am specifically instructed to use one. Frankly, I'm not sure why one way is considered "correct." First of all I would like to say aweѕomе blog! figurе out how to bеgіn. Anу recommendationѕ or hints? I've always used just one space, and my teachers never said anything to the contrary. There may have been one or two profs in college who preferred two spaces, but I can't remember them ever enforcing it. I always thought it was simply a matter of preference. Who knew? I've never heard of a thing called "the two space rule"? I was seriously chocked and surprised when I read about it, which by the way was now for the first time. But maybe it's because I live in Sweden? Maybe the rule only applies to those living in the US? Which would be odd.. This is my first time hearing about the two space thing. It feels weird to me just trying it in this comment. I keep wanting to put two periods instead of two spaces! You learn something new every day. Two spaces?!? What? That's a tule I never heard. As far as I'm aware, there should only be one space - that's the only way I've ever been taught. I'm a two-spacer. That's what I was taught in school. Actually, now that I'm typing these sentences, I see that I have apparently trained myself not to finally! I used to be a two-spacer. I'm growing. I think this grammar rule changed during my lifetime, though. In the last ten to twenty years, which is why some of us are programmed incorrectly. Honestly, though, I don't think it matters if you do one or two. I've always used just one space. Well, actually, they tried to teach me two spaces and it didn't work. However, I have other issues typing and grammar wise (not the least of which is I overuse parentheses). I am a technical writer for a state agency which generates tons of writing and we use two spaces. Apparently, the one space thing arose when computers became so prevalent and space and speed became an issue. Most writing guides, such as Gregg, still prefer two spaces. I'm a two-spacer, totally. I can't imagine how slow I'd type if I had to re-train myself to use only one! One space, always. I don't remember where this whole "2 space" thing came from but it's ugly and old! Industry standard is 1 space and that's good enough for me! chilblains with eхtremely good benefits. Hοmemade bгead iѕ not οnly еffortless to make, but іt really is more suitable fоr уou. Two spaces? Why on earth would you use two spaces!? I'm from England and I've never heard that before. We've always used one space and I don't think we were ever even told that it's possible to use two! I'd state. This is the first time I frequented your website page and to this point? I amazed with the research you made to create this particular submit amazing. Great task! I've always used one space. Even when in school they would tell us to use two I would 90% of the time go with one because it was how I learned to type. I honestly don't think I could do two spaces without a great deal of effort and even then I likely would go back to single spaces quite quickly. But hey whatever works for you is the way to do it, so if you are the two space type then fine, if you do one then that's fine too. I usually use only one space, but at university my professors insist on two. I have to be very careful to not leave only one, as they would not give me the full good grade if I did. I think it's really strange how these rules change, and I don't understand why the school system insist on one thing, when just common use insist on another. Another oldster who learned on a manual typewriter in the 1970s. It was always two spaces after a period or question mark. I am sitting here struggling to put one space after a sentence in the post. How odd this is. Only putting one space is so hard! It's such a habit for me to hit the space bar twice after a period, I don't even think about it. Whaaaaat? I have never in my life had a teacher or professor tell us to put two spaces after the end of a sentence. What is this typewriter-based nonsense?